We are relatively free to speak publicly in New Zealand, made easy with the Internet. But there are limitations, especially on specific forums (like here) where those who manage the forums are free to choose what speech is appropriate and what is not. A malicious pest has been trying to have a say here again lately – it’s highly hypocritical that they think they should be able to comment here after trying to trash the forum and have it shut down in the past. There are always other speech options available for those who want to say whatever they want. International sites like Facebook and Twitter are generally more open about what can be said on their forums, unconstrained by local (New Zealand) laws. But there are growing concerns about speech being jumped on and limited by easily offended social justice warriors. The recent overreaction to an edgy Critic menstruation issue at Otago University also showed that people in authority can be draconian at times. Today’s ODT comments on that and free speech in general: How ‘free’ is New Zealand? New Zealand is a free country. All are free to express their views. There we have two plain statements which, superficially, seem to state the obvious. But is it? And are they? In a perfect world, it could be good if both were the case. But in reality it is not straightforward. It can get quite complicated, especially when some try to speak with malicious intent. So why can we not just say and do whatever we like with impunity, even in a “free” country? For a start there are laws protecting individuals and organisations against defamation. Secondly, it is illegal to act in a way, or write anything, which incites racial hatred, while other discrimination based on a person’s ethnicity, religion, gender or sexual orientation is unlawful too. It is also against the law to encourage violence or law-breaking activities. Such safeguards are necessary in a democracy to ensure citizens can live without fear of prejudice and bigotry. Most realise this is desirable, and it is still possible to robustly express one’s opinions while exercising a degree of self-censorship. It has to be said there is also an element of trendiness when it comes to reacting to censorship. These days it is easy to get hot under the collar when a left-wing or liberal view is withheld or censored. But that does not seem to hold true for censoring right-wing or conservative opinions. It’s not clear to me what they are getting at there. In attempts at social media censorship by shaming and complaining seems to come from both sides of the political spectrum. The most prominent hard left and hard right political forums in New Zealand, The Daily Blog and Whale Oil, have both been fairly heavy handed in their censorship. As polituical activists they try to control and manipulate their messages. There is a sense that some opinions are more equal than others. That should not be the case, as long as they pass those tests of defamation, human rights and being lawful. I’m not sure what they mean their exactly, but there are examples online of attempts to belittle or shout down or cut out speech, for example of Maori radicals and old white men, and on issues like climate change. As a society we must not get prissy about challenging shibboleths. People hold views that others don’t like and that will offend others. Unless those views fall foul of the law, the right to express them has to be protected. Otherwise we are in jeopardy of living in an increasingly anodyne world, one in which any differences are suppressed rather than celebrated. People are generally free to speak up against other speech that they don’t like and they think shouldn’t be expressed. But we are still free to criticise and confront attempts to shut down free speech that should be allowed and encouraged. 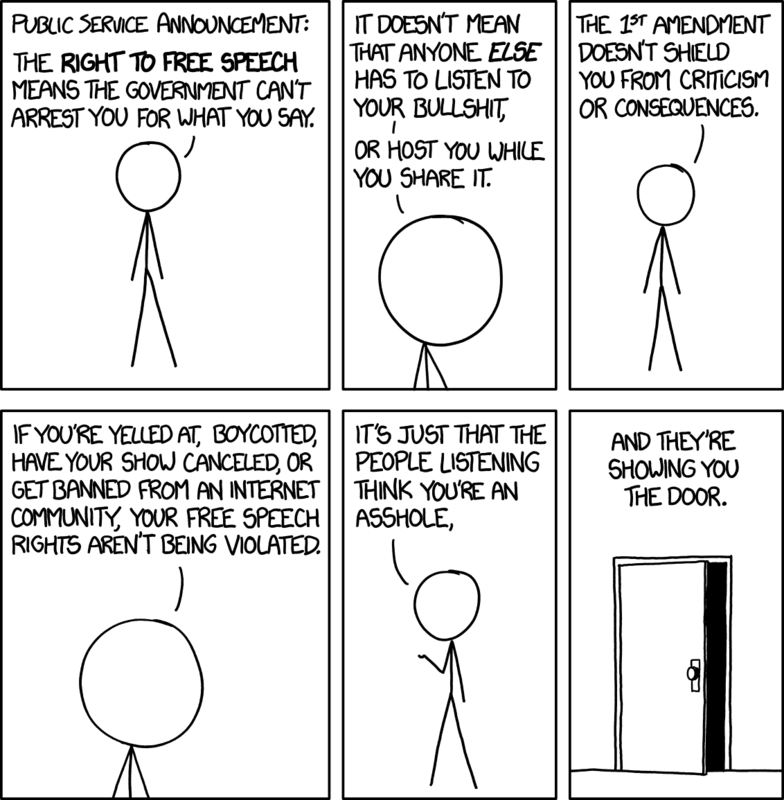 It’s worth remembering that free speech has responsibilities. This can get complicated on forums like this though, where I can potentially be held responsible for the speech of others. That’s why I exercise some editing and restrictions – I encourage a wide range of views, but discourage attempts to attack the messenger, and especially behaviour designed to drive away speech and speakers. Some restrictions on speech, like abuse and hate speech, can enhance free speech overall. BORA and HRB appear to do the job.